A favorite canard of light rail opponents is the accusation that all (or most) light rail transit (LRT) projects experience severe cost overruns; thus, projected costs of new projects are attacked for supposedly being severely "underestimated". Wendell Cox, Thomas Rubin, and other rail opponents claim, for example, that "80%" or more of light rail projects experience serious cost overruns. The result is a potent scare tactic to alarm the public and turn voters away from light rail. in reality, the budget record of light rail projects has largely been admirable, particularly when compared with alternative large public-works undertakings such as highway projects. According to a US General Accounting Office (GAO) study in 1999, out of 14 projects examined, in cities such as Denver, Portland, Salt Lake City, and Sacramento, about 60 percent of them on schedule and within budget. 79% were within 7% of budget or less. Certainly, there are exceptions – the currently most egregious being in Seattle, where the cost estimate for the region's planned Link LRT system (with over 4 miles in tunnel, including beneath the Portage Bay ship channel) has increased by some 35% over original projections. it should be noted, however, that, since actual construction has not been started, this is an upward adjustment to estimated costs, and not an overrun of a project under way or completed. And, while unusual overrun cases like Seattle's garner lots of headlines, and provide grist for the mill of zealous rail transit opponents, projects that fall within or even under budgeted costs (like Salt Lake City's Trax LRT project, completed in December 2000) gain hardly a mention in the media. Furthermore, little mention is made of the fact that major roadway projects also encounter cost overruns – Boston's notorious "Big Dig" (mainly a tunnel through the heart of the central city – see our feature on this) being a particularly egregious instance. Below is a list of some examples – not definitive, but just a sampling of the major projects which, Light Rail Progress has been able to confirm, were completed (or are currently) within budget. (1999) According to Utah Transit Authority Grants Administrator's Office, the publicly budgeted amount for the TRAX LRT system was $312.5 million at the time the project was funded. Actual payout has been almost exactly $300 – several million dollars under budget. 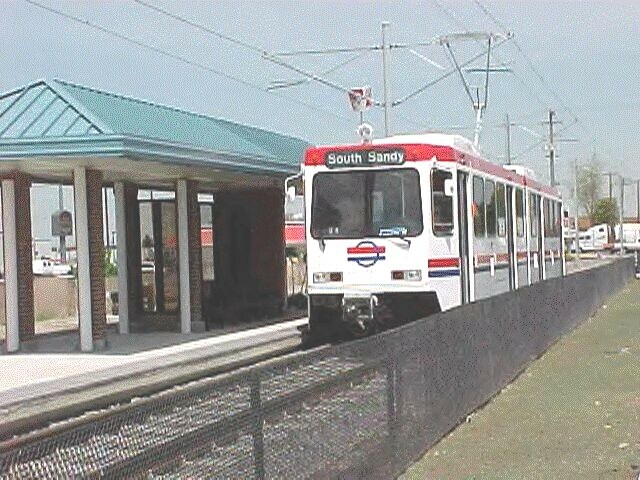 (1993, 2001) The starter line for MetroLink was completed on time, on budget for $355 million. in considering the issue of cost overruns, one should be wary of the following. (1) inflation is not a "cost overrun". Original costs almost always are expressed in dollars of the year the project is proposed. Any construction planner, public or private, for any kind of project realizes that, while original cost may be in current dollars, the actual cost must eventually take account of inflation, which is constant and ongoing. This is usually covered by similar inflation in the revenue stream. (2) The cost estimated for a project at an earlier, planning, stage, may differ from the cost estimated and budgeted at the time the project is finalized and construction is begun, when much more detailed engineering study has been completed. Cost estimates made closer to project construction are always more accurate than those made at an earlier, more remote, point in time. That also is not a "cost overrun", although rail opponents like Wendell Cox routinely treat it as such. Salt Lake City's Trax light rail project was completed on time and under budget. (3) Transit managers and decisionmakers may decide to introduce modifications and additions in the course of the project. (This is similar to, say, an auto buyer who opts for a fancier model car, or for more luxuries or accessories, while shopping in the dealer's lot.) These project modifications or upgrades are commonly issued in the form of "change orders" to the project managers and contractors. For example, the agency may decide to go with doubletracking rather than singletracking, or to upgrade the signal system, or to build a larger park & ride facility at one or more stations. They may opt to purchase additional adjacent land – possibly to farm out later for development, or to purchase extra land for parking, in anticipation of future growth. Such decisions are additions to the original project, not a "correction" to underestimated costs – and not "cost overruns". (4) True cost overruns are unanticipated and uncontrolled increases in cost, caused by factors beyond the control of the project decisionmakers - e.g., higher-than-expected bids from contractors, extra costs imposed by unexpected environmental challenges, higher costs presented by more difficult engineering or construction tasks (terrain, geological formations, etc.). Subway and tunnelling construction is particularly vulnerable to this problem, since what is underground and out of sight is inherently more prone to present the unexpected. By this measure, only a small minority of light rail projects have experienced true cost overruns. Bottom line: All transportation projects – highway facilities, airports, waterway facilities, as well as transit, including light rail – are subject to unexpected factors not foreseen in original projections and estimates. Thus, from time to time, all experience cost overruns ... Including light rail. But, while there are exceptions, by and large the record of light rail projects has been enviable compared to many other transportation projects.